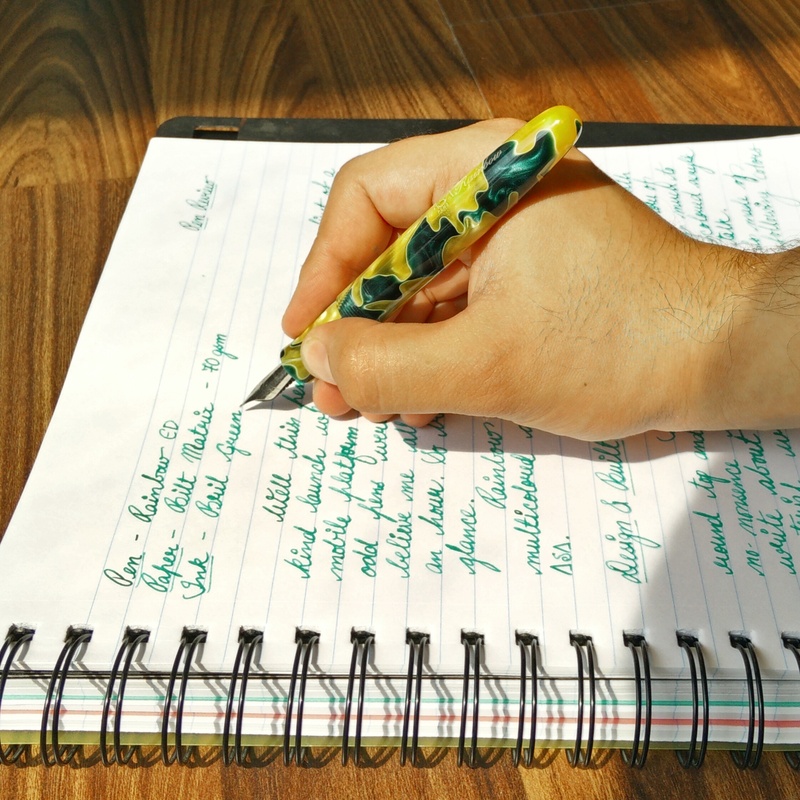 The review is about a pen which was launched on Whatsapp Group of 20 members at that time and I believe was first of its kind launch for a pen. 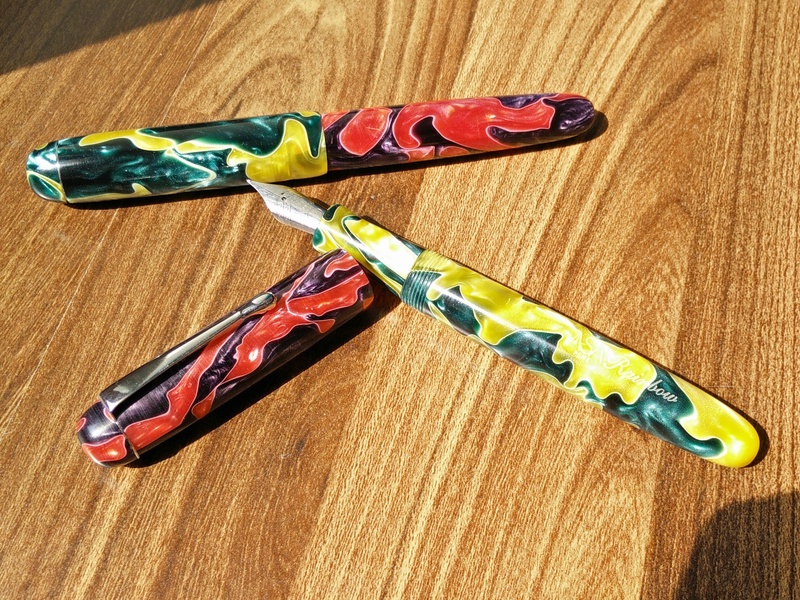 Approximately 50 odd pens were made and beleive me on this all got sold out within half an hour. So beautiful were they to look at first site. They were RAINBOW. This happens to be an ED model and the updated model with C/C mechanism is soon to be launched at ASA Pens on 23rd September. 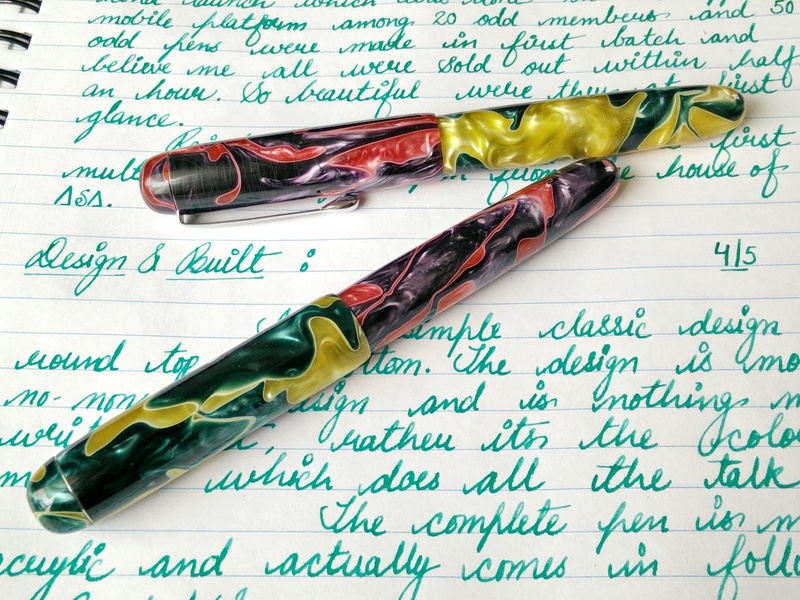 Rainbow is first multicolored acrylic pen from the house of ASA Pens. It’s a simple classic cigar shaped pen with rounded bottom and top. Actually nothing is much happening on the design front. it though is a small pocket sized pen. It is actually the material which is doing all the talk. 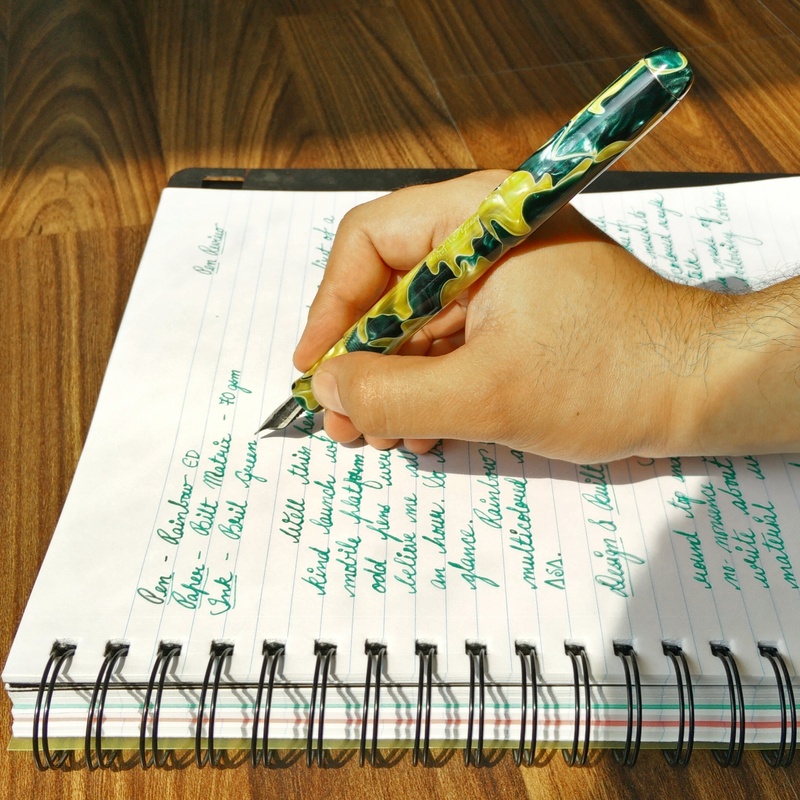 The pen will to begin with eventually will come in following colors when launched. The color yellow with green swirls might be added later which is being reviewed. To begin with what i really like about this pen is its size and girth. 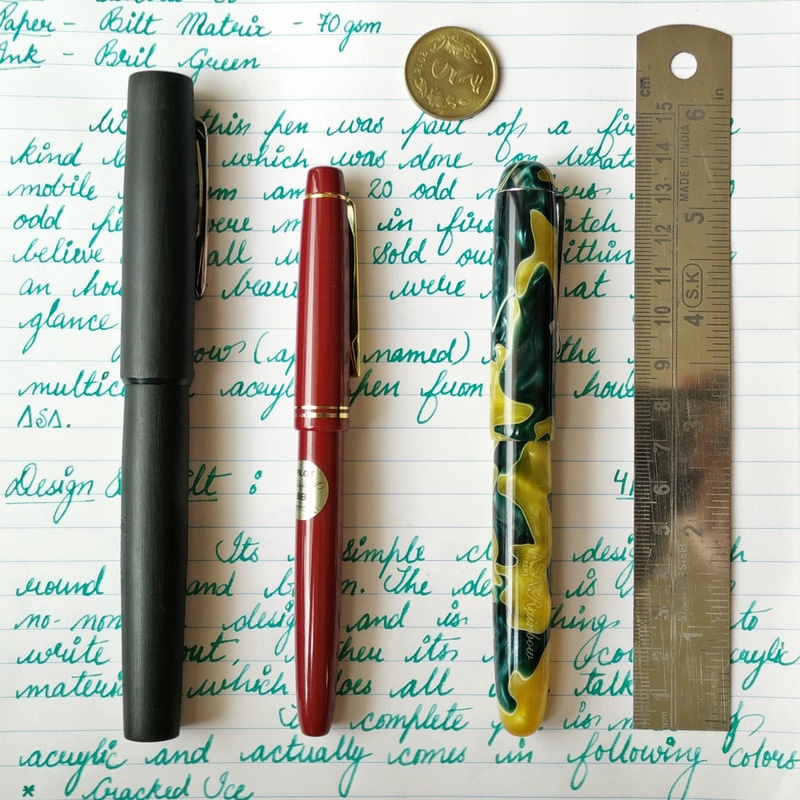 It is small pen but not that slim. 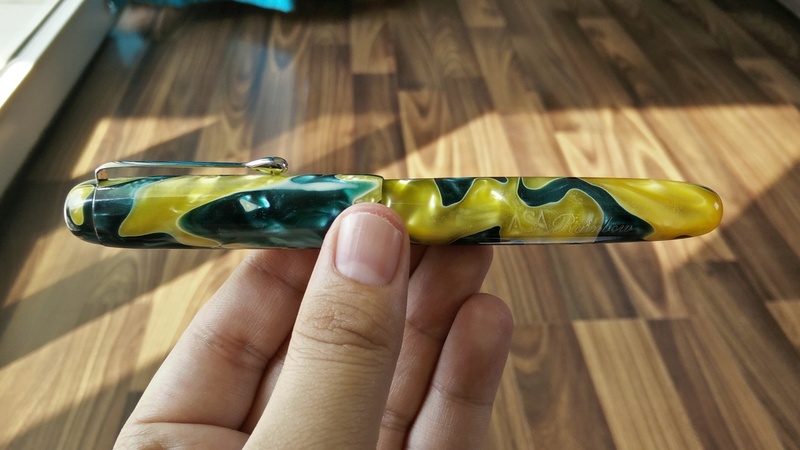 Lovely part is the grip section which is the thinnest portion in whole pen. 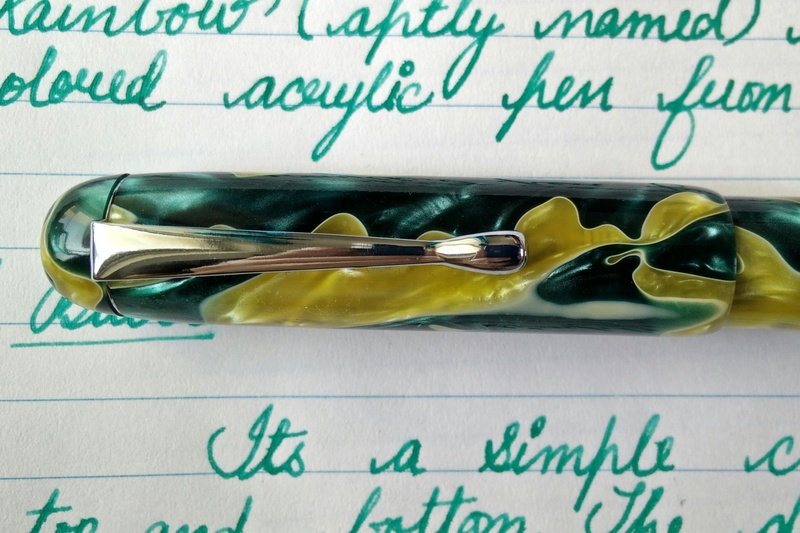 It’s so wonderful to grip and write with this pen. The pen has silver trims. Actually the pen has only clip as a trim and a nib. No other metal parts were used. its a minimalistic design pen. The clip is sturdy and stiff and not springy at all. fits shirt pockets easily. 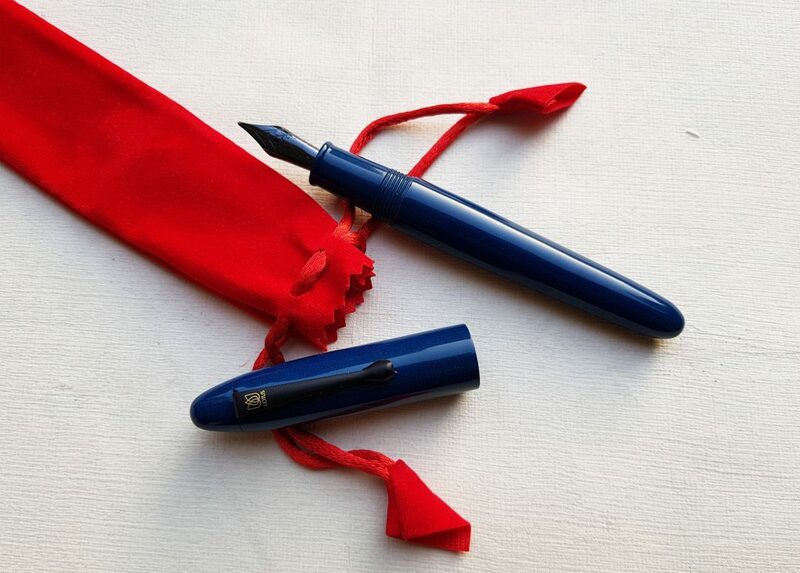 The pen cap has no breather hole unlike many other Made in India pens. The cap finial is threaded and can be taken out easily also. 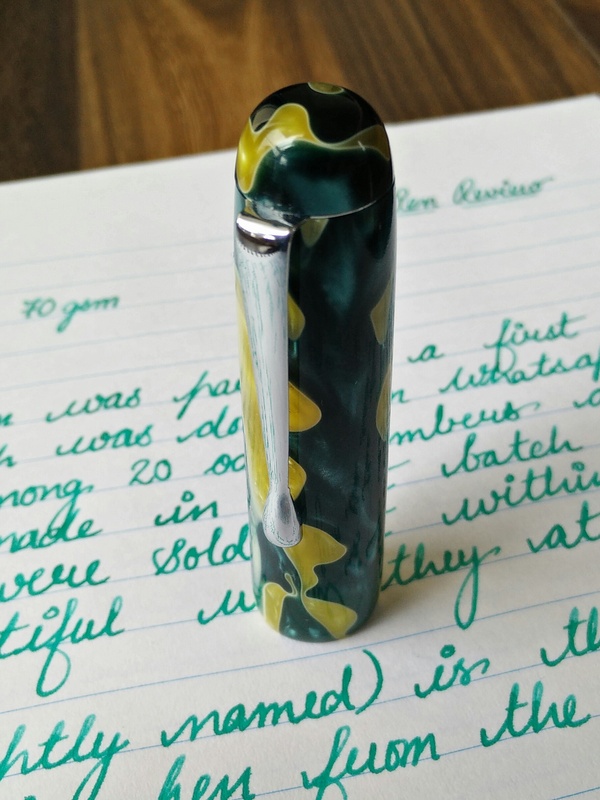 Built is amazing and is well finished and polished pen. however i have to add one thing this pen is acrylic and requires maintenance and care to ensure no scratches just by throwing pen on desk or anywhere else. 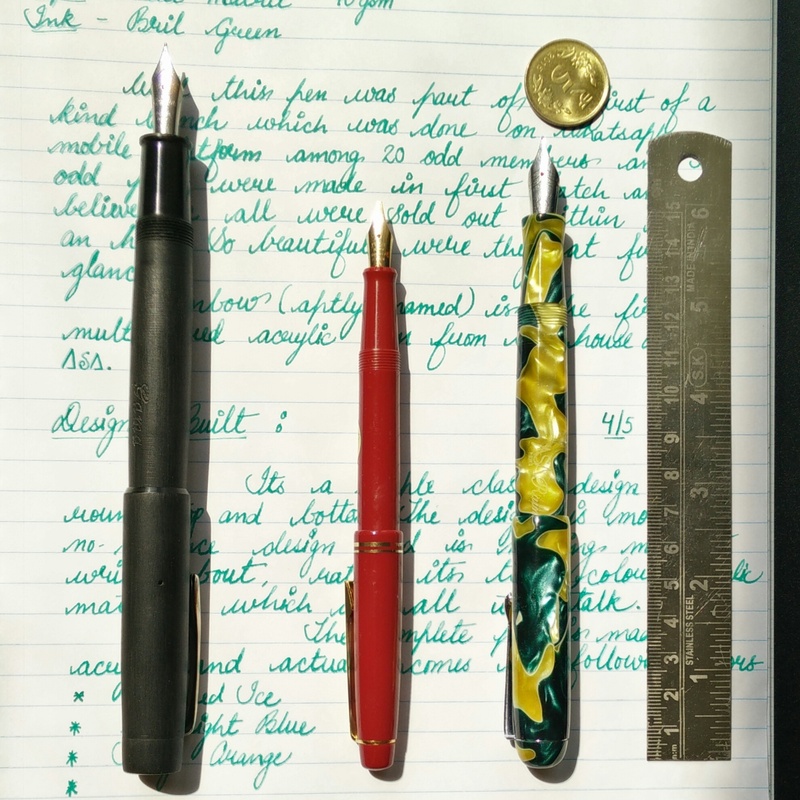 Below are the few images of the pen showing comparison with other pens. I love the fact that the small pens don’t have to be necessarily slim and this really goes down well with me. And i love ASA Rainbow also because of its girth too. 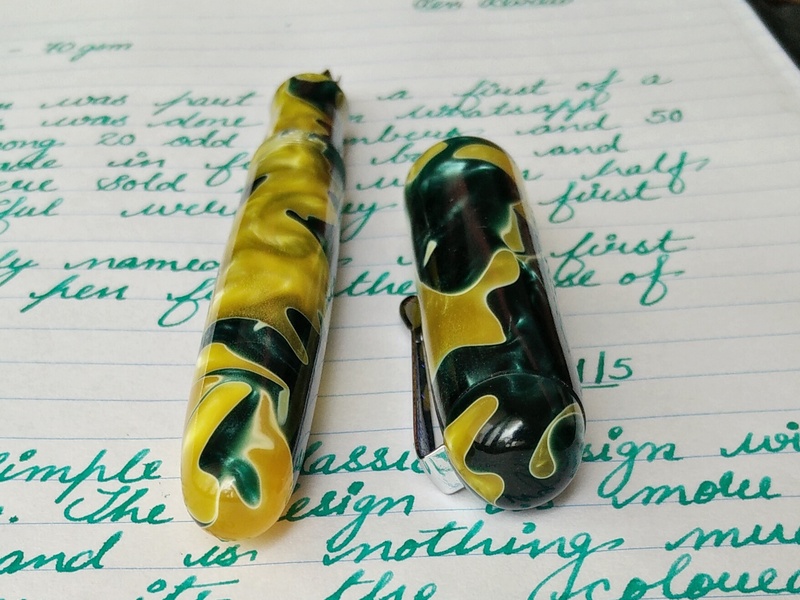 Its very well balanced pen and feels amazing in your hand whether you write with cap posted or not at the back. The cap posts very securely and also posting does not add to that much heft. This one is aptly balanced pen. 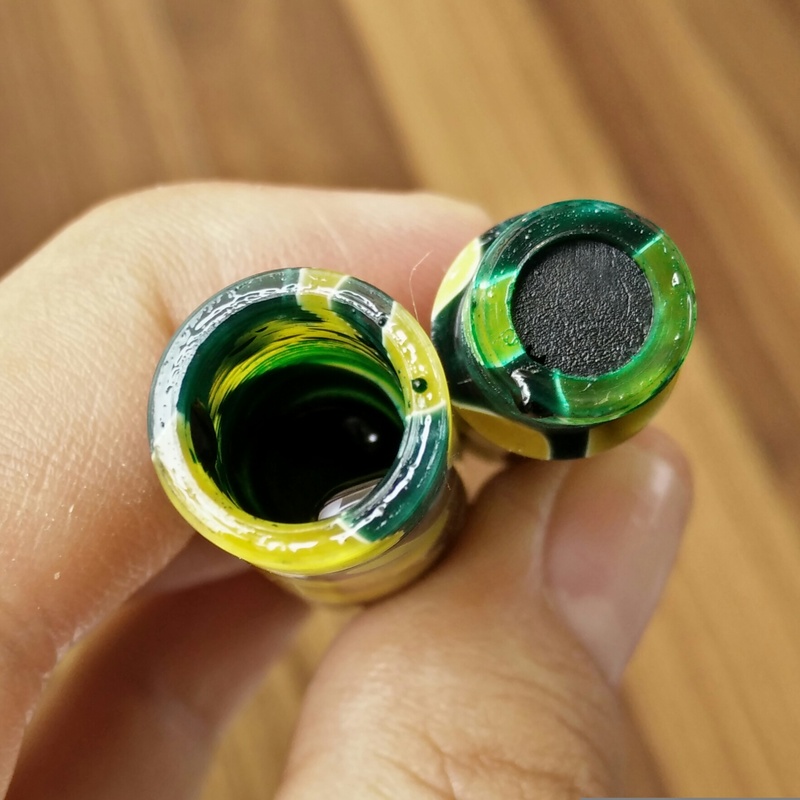 Our first feedback for this beautiful pen was to make it C/C mechanism pen because ink filled in barrel changes the color of the barrel and darkens it and thus it will be soon launched with C/C mechanism on 23rd September. 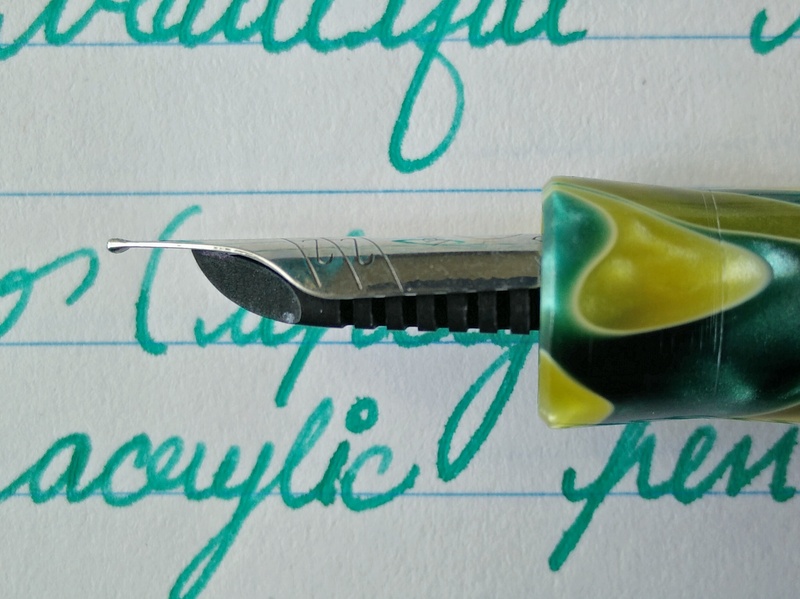 The nib on the pen in question is Fine-Medium Ambitious 35 mm nib (#6) and is chrome finish. I love the ambitious nibs of size 35 mm and 40 mm. 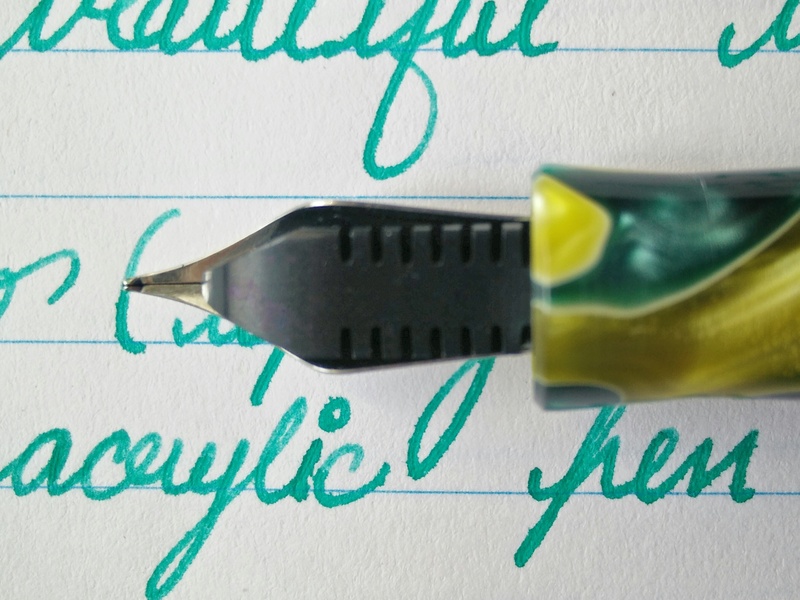 This nib writes with welcome feedback and writes wet. 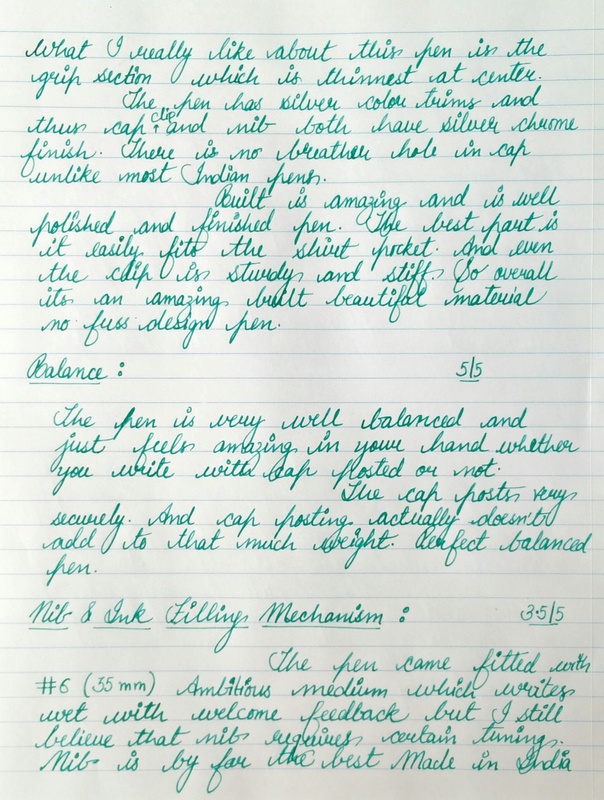 I love the way it writes. 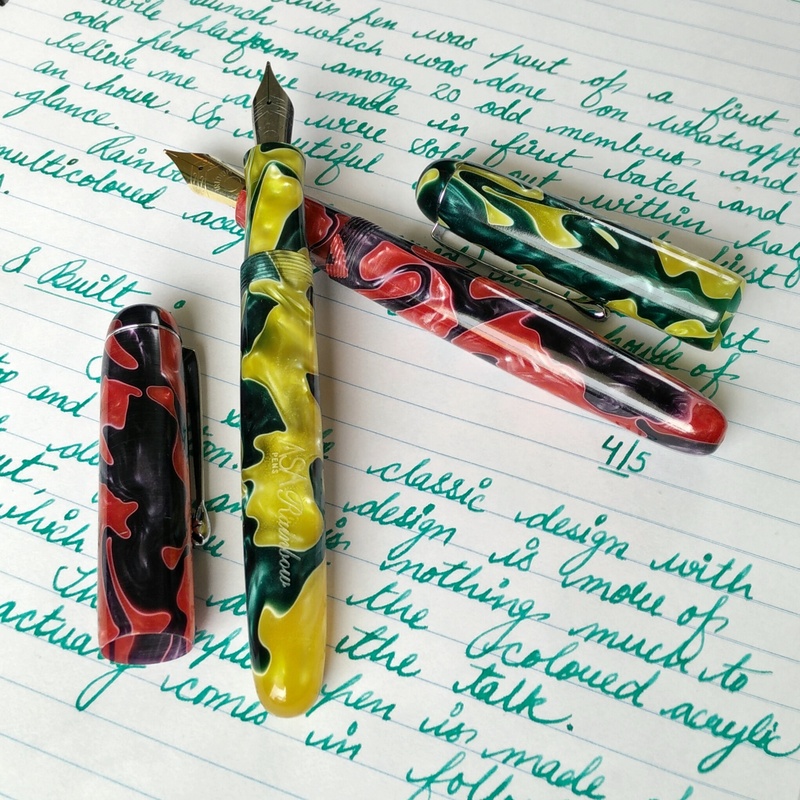 The nib has got certain springiness to it. 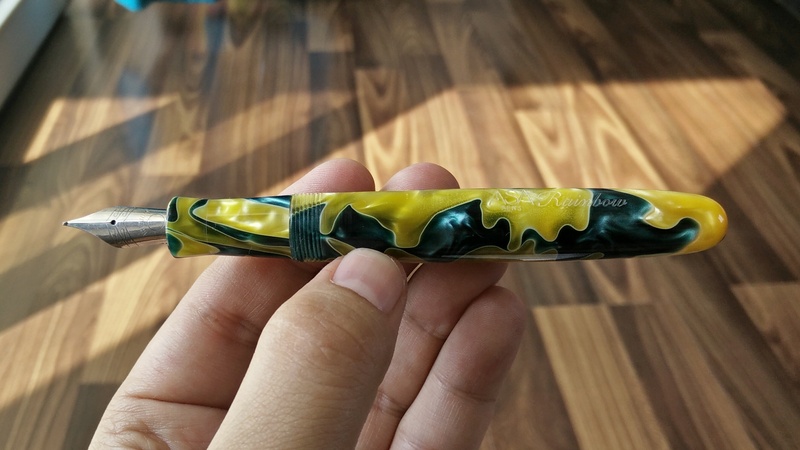 This pen has an eye dropper fill mechanism and hold good 3 ml of ink. 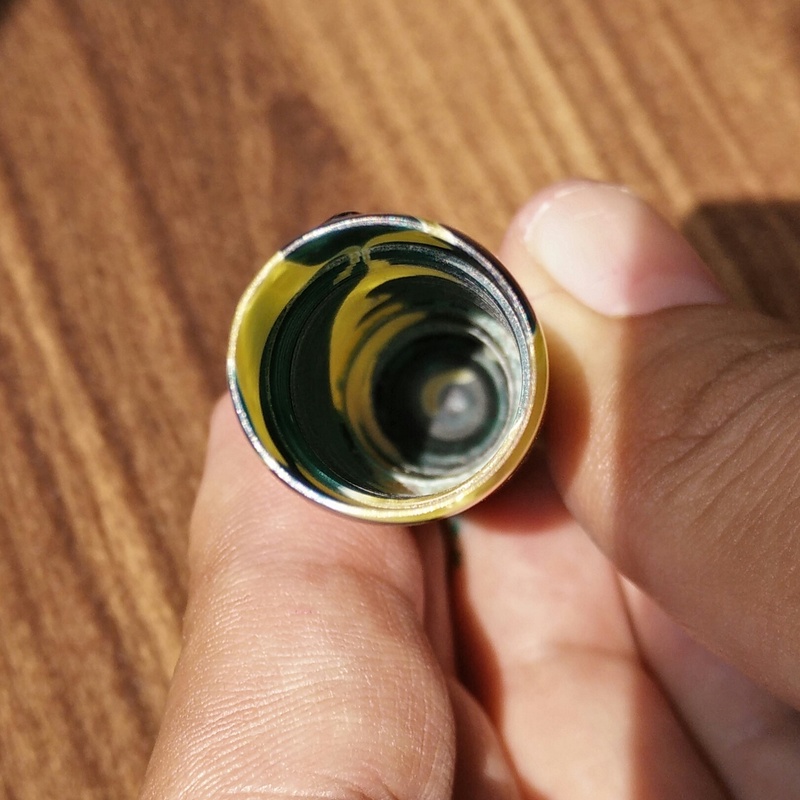 The feed is made of ebonite and fitted very tight and securely. 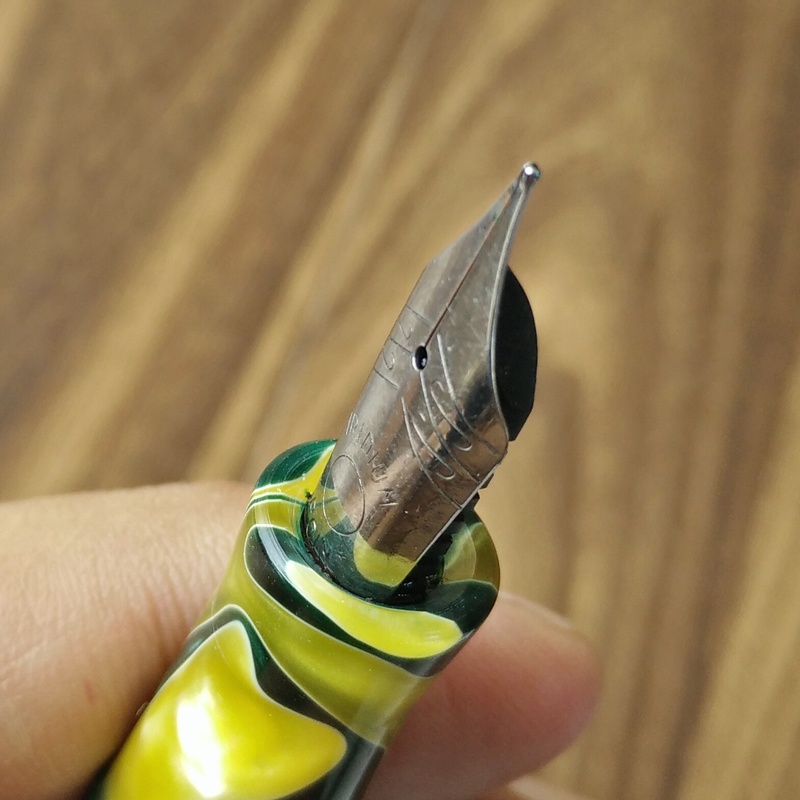 The removal of nib will require knockout block as the nib is friction fit. 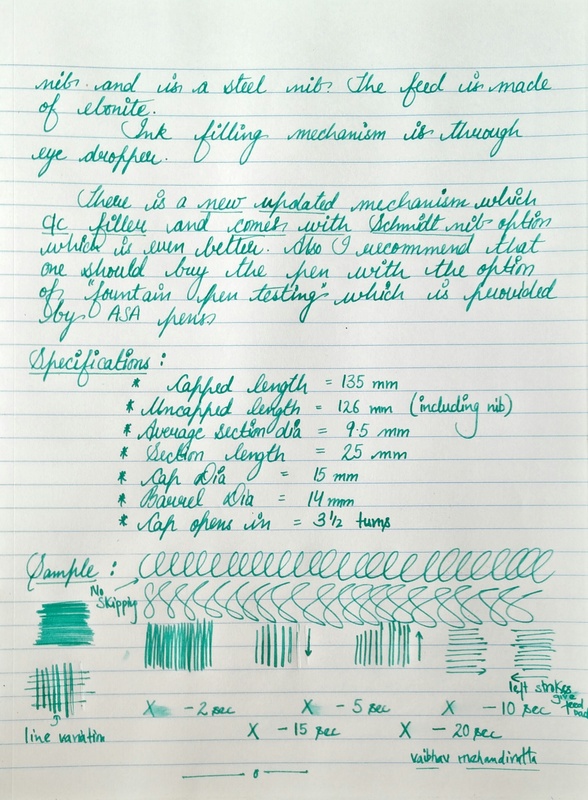 I recommend people to buyers is to chose pen with option of fountain pen testing at checkout which takes time but you get the pen which writes good out of the box and this facility is being given by ASA pens free of charge. 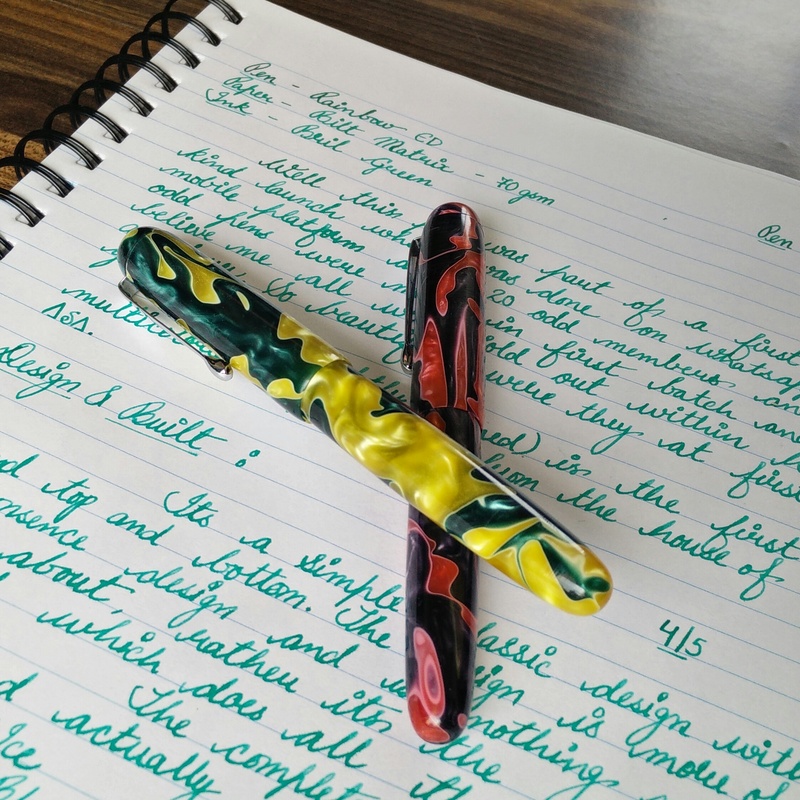 This is a beauty and I am sure it will outsell any other model ASA pens has launched because this pen has it all going for it when its launched in C/C mechanism. However i would not recommend using this pen as ED as the barrel gets discolored because of the ink not that the ink burps. Go ahead save some money to buy this one. I recommend it. 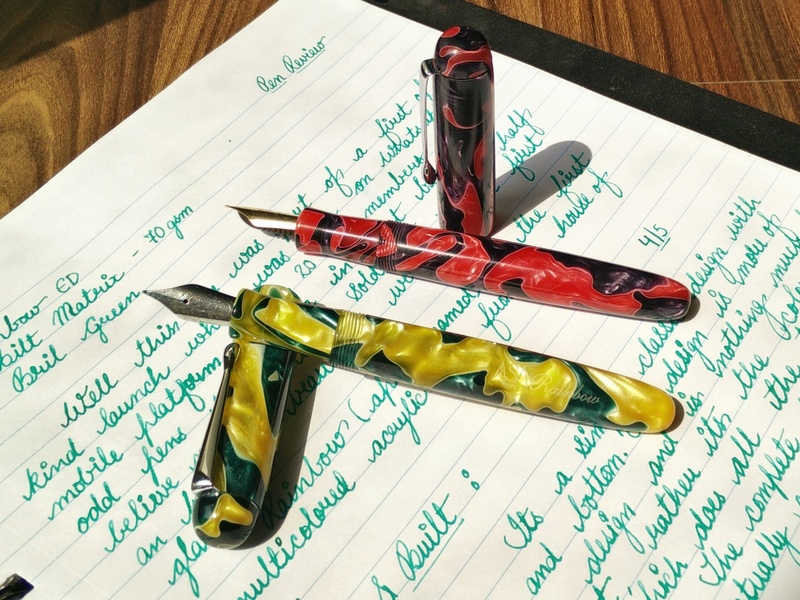 Hello, I would like to know that using the pen as an eyedropper in the darker shade like the cherry swirl, which I have decided to buy, would it change the colour too much? 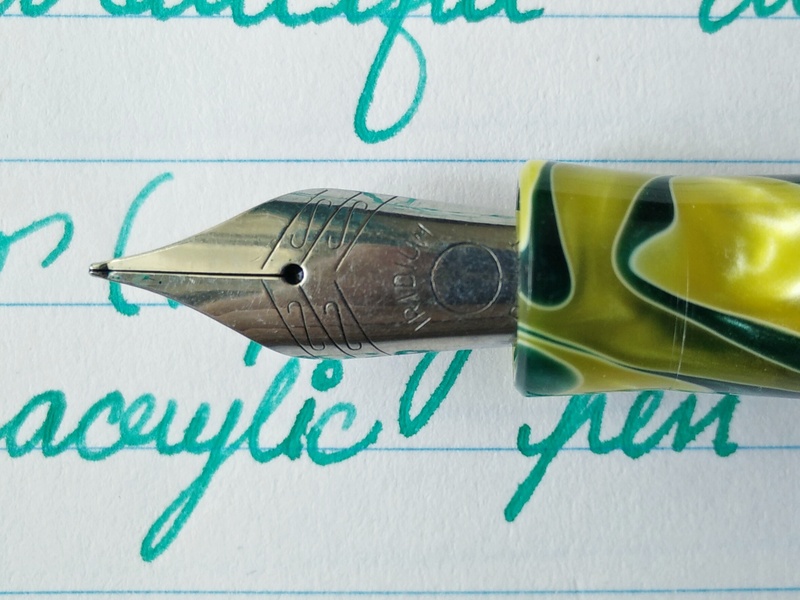 I prefer eyedropper over the c/c mechanism,as eds hold a ton of ink. And is the pen much prone to scratches? Every pen is prone to scratches.. 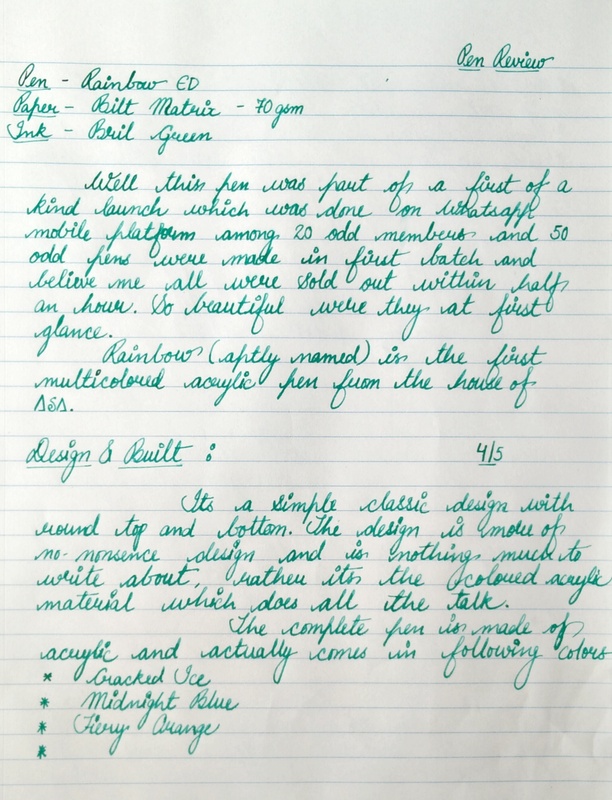 If you don’t take proper care of the pen it will be surely not in good condition..
And yes in darker cherry Swirl there won’t be too much color change if you use as eyedropper.. Though yeah.. Color change will be there for sure.. Such a wonderful review, thank you. The pen is a looker. But why would they leave out the green and yellow which is the standout colour. Thanks for yet another well crafted review Vaibhav, it’s great as always! I’ve always wanted to get an ASA FP for myself but somehow none of their models appealed to me. The Rainbow certainly looks different from the others though and I might just get this one on the 23rd. Thank you for going through review. An I agree this pen grows on you with time.